Sony's PS4 Coming Before Microsoft's Xbox Next? John Carmack thinks Sony's next-gen console--call it the PlayStation 4 if you will--seems likely to be first to market in the inevitable next generation cycle. That's what he told Polish site CD-Action, anyway, noting that Sony going first would probably be to prevent "the same kind of 360 lag from happening to them again." That out of the way, the story here isn't what Carmack casually dished about Sony's hypothetical next console, but that that's the only thing everyone else seems to have gleaned from 30 minutes of footage, nearly all of it to do with id Software's upcoming shooter Rage. About the next generation, Carmack only offers in passing the same sort of opinion anyone who's paid even cursory attention to the current situation might. You don't need a degree in video-game-ology to riff off of hindsight. If you want to listen to the full interview (it's just Carmack talking to a camera, so it's in English) I'd recommend it for all the stuff glossed over elsewhere. Stuff like: Carmack's developmental insights about leveraging technology, texture performance, the mod scene, 60 versus 30 frames per second, and more. 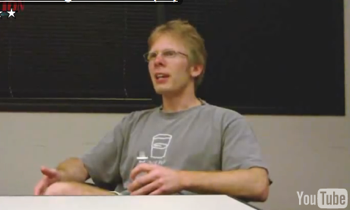 Whatever you think of Carmack's games, he's always interesting to listen to. But if all you care about is whether John Carmack has a time machine, ESP, or super-secret-insider-access, here's the third part of the interview. The whole jockeying for who's gonna release next gen console first is very interesting and really divorced from the technical side of things. Whether Sony wants to try and jump the gun to, you know, to prevent the same kind of 360 lag from happening to them again seems likely. As developers, we would really like to see this generation stretch as long as possible, you know, we'd like to see it be quite a few more years before a next-gen console comes out, but I suspect someone will wind up shipping something earlier rather than later. See what I mean? "Nothing to see here, move along..."
My prediction? Someone will almost certainly make another prediction by the time I've finished typing this. Check out twitter.com/game_on for even more game-related news and opinion.